Have you ever held a baby and thought “What do I do with this thing?” On Friday night, I went to visit my sister and my nephew, Carter (who is 1 1/2). Her friend happened to be there with her little one, who was only eight months old. She asked me if I wanted to hold her and I said yes. I held her and it was fine, until she started to squirm. Then I had that recurring thought of “What do I do with this thing?” My maternal instincts (or lack there of) didn’t kick in. The situation just felt so foreign to me. I had no choice, but to give her back to her mother. In doing that, I think I saved both the child and myself from some discomfort. Somehow I think all the maternal-related genes went to my sister and skipped right by me! One thing that was passed down to me, was the ability to cook. This Mother’s Day, I had my mom and dad, sister and her hunny, as well as my nephew over for dinner. 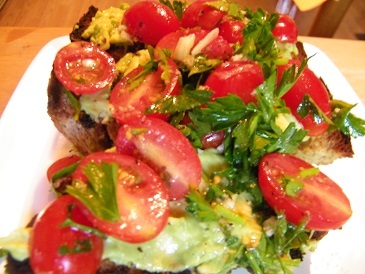 I started the night off with avocado and tomato bruschetta. I saw the recipe posted on Thom’s blog Don’t Switch Off the Light (click here for the recipe) and knew it was the perfect way to start our Sunday dinner. Everyone raved about them. The only small change I made was using parsley instead of fresh coriander, which I had trouble finding at the grocery store. 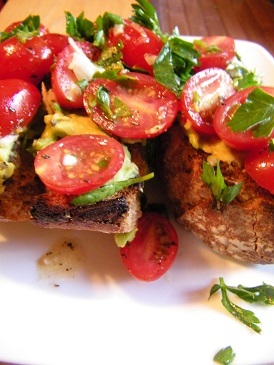 These were great as an appetizer, but I could also see them being an easy, yet portable lunch. There is one bit of advice I have for you if you make them, don’t serve them on a plate. Serve them on a platter with edges at least an inch high. I made about six pieces of them and on the way outside my mom, my sister, and I managed to send two of them flying to the ground. Instantly avocado and tomatoes covered the floor and my shirt. We just couldn’t keep them on the plate! In the midst of it all I also managed to bump my head on the door. It could have been a scene from The Three Stooges. Aside from the short comedy act, dinner was delicious. My mom complimented each of the dishes served several times, which meant a lot to me, since she was the one who taught me most of what I know in the kitchen. I also consider her standards to be pretty high, but only because her cooking is amazing 🙂 Besides the bruschetta, I also made a crispy kale salad with balsamic vinaigrette, an avocado and chickpea salad (find the recipe to a version I made before here), and a variation of Angela’s coconut macaroon’s (from her blog Oh She Glows).